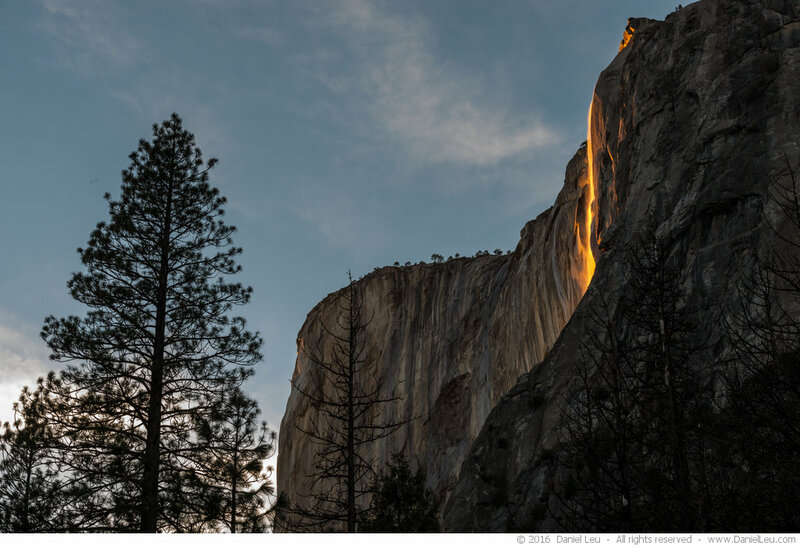 Each February, a small seasonal waterfall on the east side of Yosemite’s El Capitan brings on a show: the setting sun illuminates Horsetail Fall. When looked at it from the eastern side, this backlit waterfall glows intensely for a few minutes before dusk. It is something beautiful to see. 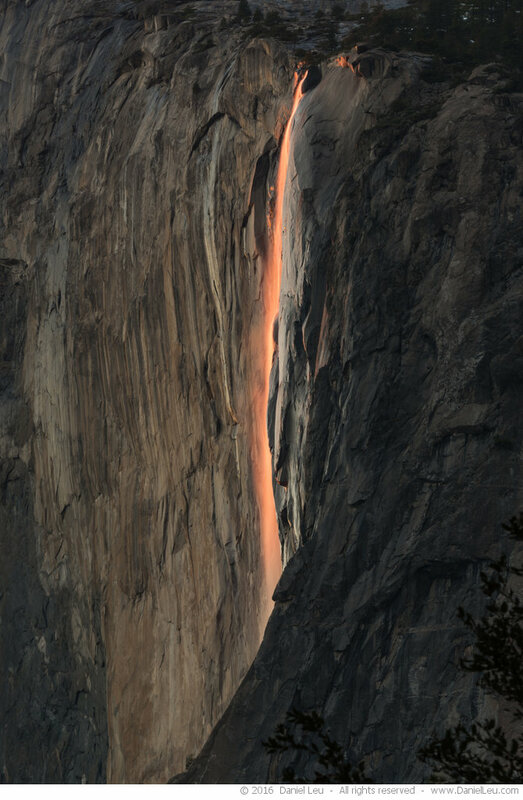 Some call this effect the natural firefall in reference to the Glacier Point firefall (from 1872 until 1968, minus some interruptions, glowing amber was pushed over the ledge at Glacier Point creating a “Waterfall of Fire“). Not all sunsets are equal though. 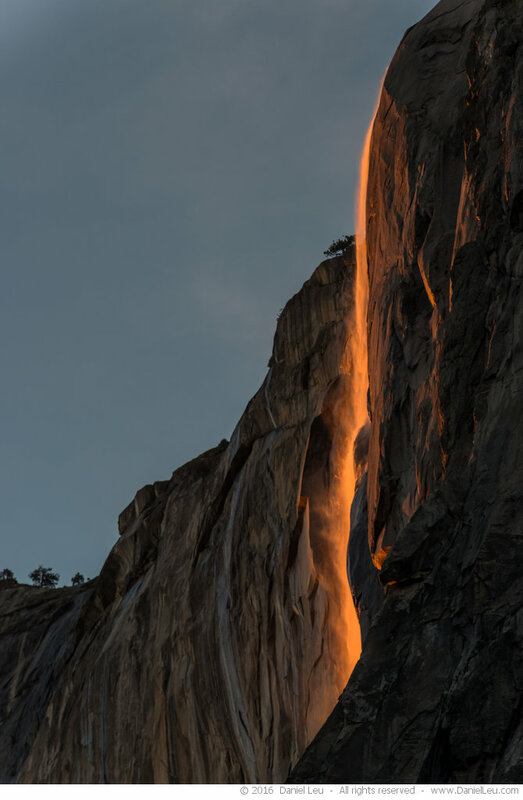 The conditions must be just right to see a glowing Horsetail Fall. Many visitors try for years without luck! Together with friends, we happened to be in Yosemite for President’s day weekend. They had not been aware of this spectacle previously and wanted to see it. Although it was a few days too early to get the best show, the conditions on Saturday afternoon looked almost perfect. It was warm during the day which helped increase the water flow and the sky was clear towards the west. So we headed out and stopped at the south drive viewing location. For a few years now, the park service has been closing one side of the road for stopped vehicles. This is very helpful as it prevents people from trying to be creative in finding a place to park their cars. We arrived a little late at 5.15pm but still had no trouble for parking. 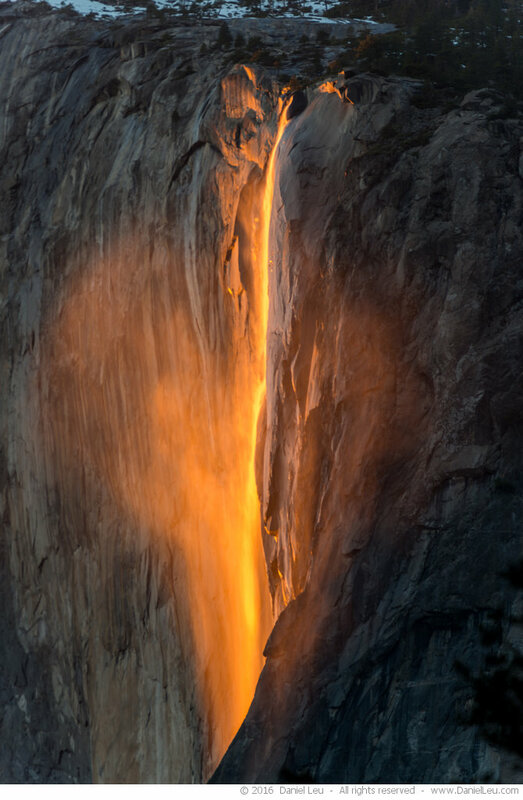 The light on Horsetail Fall was already beautiful. As usual, there were many spectators, but it was also easy to find a spot to setup my tripod. I have experienced this impressive show already several times, but Saturday was the best display I have ever seen. There was a little breeze going on, which played well with the mist of the waterfall. At one point of time, the mist looked like a heart. And this on the eve of Valentine’s Day! While reviewing my images, I discovered a series of 8 photos taken in short succession. While advancing from one to the next, it looked like a stop-motion animation. This gave me the idea to turn this into a little animated gif. Doesn’t this look like lava flowing down the wall? One of the criteria that defines the best time to see this phenomenon, is how much light is still visible on El Capitan’s face. We were a week before prime and it shows on the images above: the sunset light not only illuminates the waterfall but the rock face too. In this context, the next image is much cleaner. It was taken about five minutes later. The angle of the sun is much better as the shadow from the nose blocks the light hitting the wall, but its strength is already much diminished. A few days later, the sun will be at the same angle but a bit earlier and with much more power, creating a better display. Monday afternoon, on our way back home, we stopped by El Capitan Picnic Area. This is another location that is well known and very well visited to see the glowing waterfall. I wandered a bit off and found a spot where one can see Horsetail Fall together with the main face of El Capitan and its famous Nose. I really like this capture as it shows a bit more of the Yosemite Valley scenery than just the shining water flowing down. Monday’s show wasn’t bad, especially for those who hadn’t seen it before. But it was not comparable to Saturday’s. I really like the angle from this location. It creates an image that is very different to the common views from the south side location or from the picnic area parking lot. That’s definitely a spot I will visit again in the future.